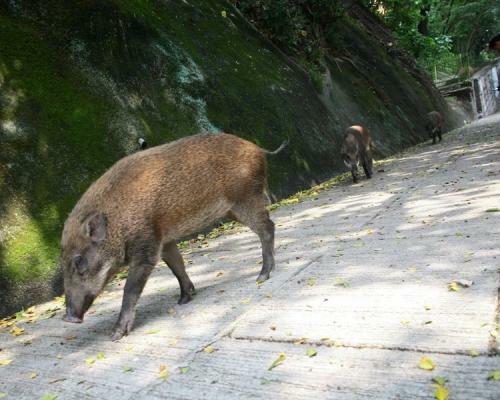 For some residents in Tai Po, the year of the pig came early yesterday in the form of a mob of some 20 city officials attempting to chase down a wild boar in the area for three hours.
. Twenty police officers and personnel from the Agriculture, Fisheries and Conservation Department (AFCD) were subsequently sent to the scene. 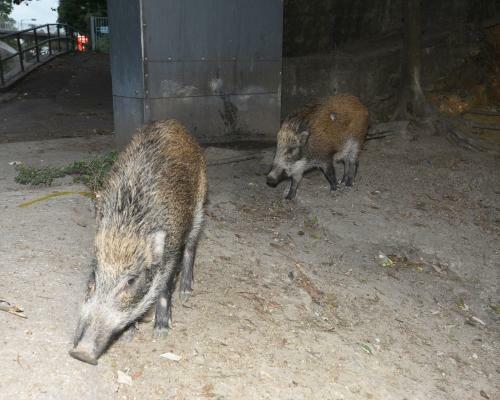 By the time police arrived, the wild boar had left the estate and made its way to Lam Tsuen River near the center of Tai Po, a few minutes’ walk from the estate. 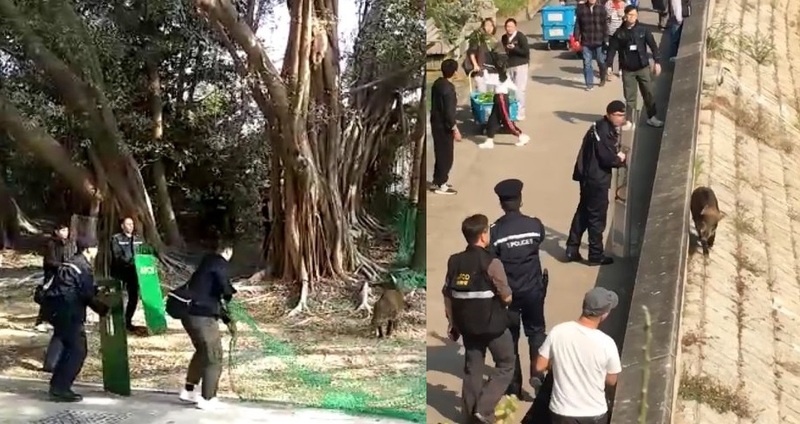 One video posted online yesterday afternoon shows two police officers — one armed with a shield — walking alongside the wild boar which is walking along the embankment of the Lam Tsuen river, while a group of about 10 people look on.
. No longer thwarted by the low wall that separated them from the boar at the riverbank, police and AFCD officials enacted what is known in law enforcement circles as the Benny Hill Protocol, fruitlessly chasing the pig back and forth around a small patch of ground wielding nets and shields. In another video, the evasive animal can be seen managing to slip the cuffs again, outmaneuvering 10 officers and AFCD personnel. According to a video report by on.cc, the standoff eventually ended just before 4pm at Ting Kok Road, where the animal was caught, caged, and sent to the AFCD headquarters to be examined. , which are presumably better at catching pigs than police officers. The government scrapped their wild boar hunting program in 2017 and replaced it with a contraception scheme that involves capturing and sterilizing wild boars before releasing them back into the wild. The pilot scheme was launched in February, and as of December, the authorities had captured and sterilized 54 wild boars. This is crazy, so many officers were sent to the scene for this pig. that is pretty crazy. I never seen this scenery before. luckily they are able to catch them while they are running all over tai po.